Food is a pretty important thing to me (as if you couldn't have guessed that). But even more important, is where that food comes from. When I was younger, my family owned a health food store. My Grandfather's garden (and eventually our own garden) was the source of our produce. Our milk was delivered, in glass bottles, right from a local farm. I even remember weekly stops to other local farms to pick up our eggs, honey or whatever else we needed. Suffice it to say, from a very young age, I knew that it was important to know where my food was coming from and you better believe I knew where my food was coming from. The food values my family taught me at such a young age are not ones I have forgotten. If anything, I'm even more meticulous about where my food comes from. Then again, living in a city, you kind of have to be. Gone are my country days of meandering down the street to the local farm. Now, it's all about dashing around the concrete jungle, trying to determine which of the hundreds of stores is going to have just what I need. But soon, thanks to a new New York state program, my past and present food lives may be more similar then it would seem possible. No, I am not dashing to a local farm to buy our produce (although, really, I probably could, as there some 36,000 farms around the state). I am, however, getting access to local produce right here in the city (or around the state) thanks to Empire State development's new initiative, New York State Grown & Certified. NYS G&C is a voluntary program that ensures farmers are using safe practices, conserving natural resources and producing and packaging in a way that minimizes food safety hazards. On the consumer front, that means you, as a New Yorker, can feel good about the food you're eating, because you know how it was grown and where it came from. Better still, you're helping out the community by supporting local farms. Really, it's a win-win all around. To get an idea of just how the program works, we were invited to check out one of the farms participating, Minkus Family Farms. 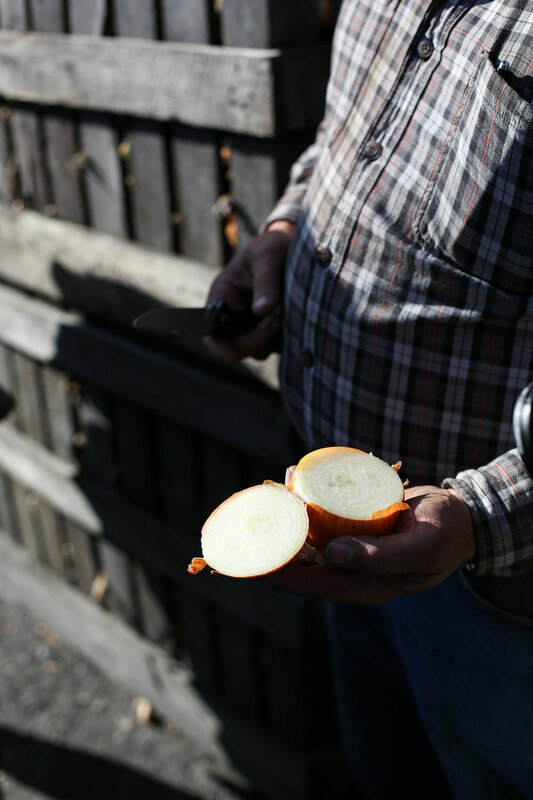 Located in Southern Orange County in the area known as the "Black Dirt Region" (aka extremely fertile soil that is a result of ancient glacial lakes + a history of flooding), this family-run farm has been producing onions for 23+ years. Harvest season is typically the end of July into August, so while we didn't get to seeing any picking or planting, believe me when I say there were no shortage of onions on site. 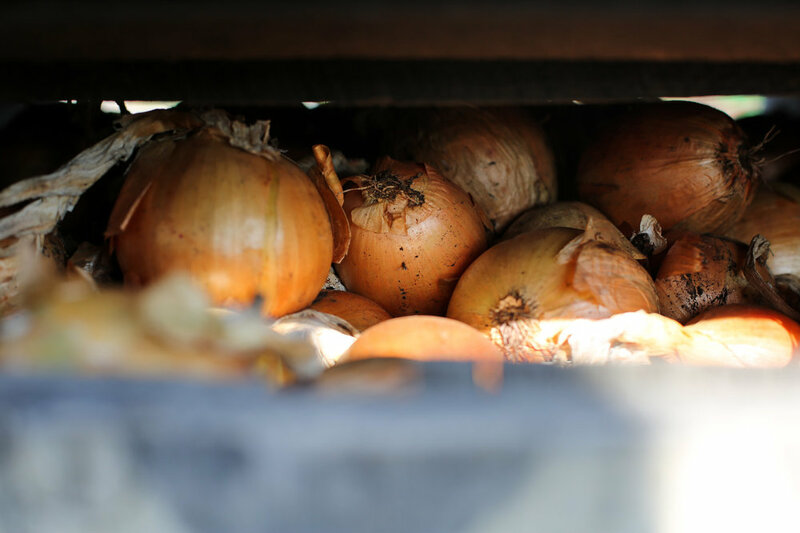 In fact, they actually have a storage room where they store millions of onions (and I do mean millions) that they package up throughout the year. Both Rick, the farm owner, and his son-in-law, Dylan, who oversees and manages operations, business development and food safety, took us through the farm explaining everything from how they ensure food safety to how they responsibly farm the land (i.e. crop rotation) to how the onions get their layers/rings to how they keep the onions fresh for months, and even how to pick out a good onion (make sure the onion is firm and that the stem portion is completely dry...any moisture on the stem typically means the onion is rotting). As someone who puts onions on pretty much anything, it was a truly fascinating place to visit. Whether it's onions from Minkus farm, or any other produce grown throughout the state, come early spring of 2017 keep your eye out for the NY State Grown & Certified labels in grocery stores and green markets, so you too can get your hands on a taste of farm-fresh, responsibly produced, locally grown fruits and veggies. You won't be disappointed. P.S. While I can put onions on just about anything, I was inspired, not only by the onion farm and this program, but also the time of year, to create an easy delicata squash recipe loaded with, what else, but lots of sauteed onions straight from the Minkus Farm. It's a simple dish that's pretty enough for something special, like Thanksgiving, but easy enough for a weeknight dinner. If you're an onion/fresh produce lover like me, then I know you'll enjoy it! Preheat your oven to 375 degrees. Lay your delicata squash slices in a single layer on a baking sheet. Drizzle generously with olive oil and sprinkle with salt. Bake for 20 minutes, flip slices over and then bake for 10 more minutes, or until both sides or golden brown and slightly crispy. Meanwhile, in a medium-sized skillet set on medium heat, melt the butter with a tablespoon of olive oil. Add in the onions, sprinkle with salt and sauté, stirring occasionally, until the onions are translucent and tender, about 12-15 minutes. To assemble, layer the squash on a plate. Add on the onions, then drizzle with the tahini mixture and sprinkle with goat cheese, almonds, pomegranate seeds and thyme. Season with salt and pepper, to taste. This dish can be served immediately, or made in advance and stored, covered tightly with plastic wrap, in the refrigerator up to 24 hours in advance (you may just want to add on some fresh goat cheese, thyme or tahini to freshen it up).